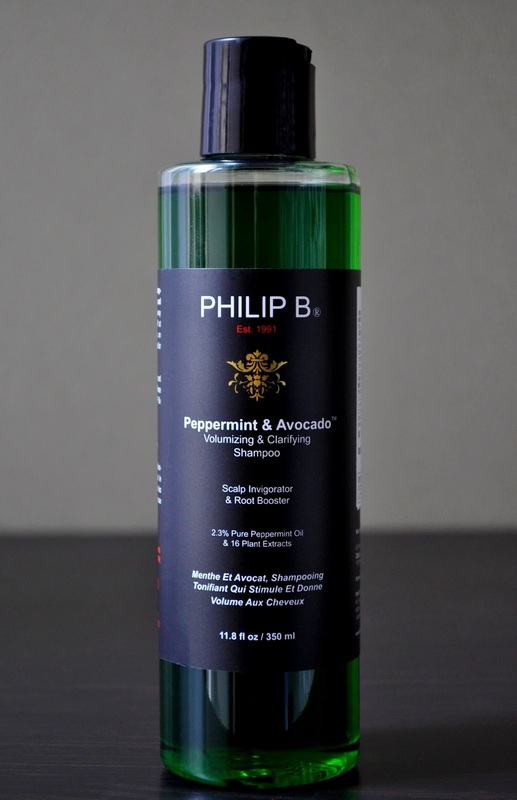 Philip B's Peppermint & Avocado Volumizing & Clarifying Shampoo, and Kenra's Clarifying Shampoo are my favorite deep cleansing shampoos; I positively love both of these clarifying shampoos equally, and I'm always rotating between the two. Depending on the season, I wash my hair every other day or every two days. I use several heat styling and finishing products to protect and maintain my hair. However, if you combine the daily use of these products with my scalp's natural oils, my hair can accumulate a fair amount of build up. Formulated with 2.3% pure peppermint oil and 16 plant extracts, the Peppermint & Avocado Volumizing & Clarifying Shampoo is the remedy keeping my hair from looking weighed down and limp; it lifts all the gunk and excess oil out of my hair, leaving it squeaky clean without stripping any moisture, shine, or color. I use the shampoo once a week, and leave it in my hair for a few minutes before rinsing and following up with one more lather (again, leaving it on for a few more minutes). I thoroughly enjoy the stimulating, crisp, cool-tingling sensation of the Peppermint oil on my scalp, as it at times feels taut from all the heat and pulling from blow drying. Also, whenever I use the shampoo, my roots and hair have a little more volume and a bouncy "oomph," allowing me to go a day longer before my next blowout. I always purchase the 32 fl oz bottle of the Peppermint & Avocado Volumizing & Clarifying Shampoo, but I was out of a clarifying shampoo, and my now oily scalp couldn't wait on an overseas parcel; thus, I had to settle on the 11.8 fl oz size (5,508 yen) I purchased at Isetan Shinjuku. I just ordered the 32 fl oz bottle of this guy. I've wanted to try the Russian Amber collection as well. I may pick it up after I'm done with my summer shampoo and condition. Russian Amber sounds so delicious for fall. Your hair always looks so nice and well-kept. I have a question - how do you go about conditioning after you clarify? I don't heat style on anything like a regular basis, but I do have wavy/curly, fine textured hair so I end up having to use quite a bit of product to keep it from frizzing and flying about willy-nilly. I like to clarify every so often to start with a clean slate and ensure my scalp doesn't get itchy build up, but whenever I do I never nail the conditioning afterwards. Too light and my hair looks like a dandelion when it has gone to seed. Too heavy and I lose that luscious volume I was attempting. What is a girl to do? After clarifying, I apply a hair masque from the midlength of my hair to the ends, applying a little more on the ends. My all-time favorite masque is Wella's SP Luxe Oil Keratin Restore Mask. I swear by this mask and highly recommend it! Also, after a clarifying treatment, I make sure to use a very moisturizing leave-in conditioner. Another fav is Alterna's Caviar CC Cream 10-n-1 Complete Correction.